“HEALTHY” IS NOT THE FIRST WORD THAT COMES TO MIND WHEN YOU THINK ABOUT FOOD TRUCKS. Long the domain of carnitas tacos, pork belly bao, and donut burgers, these mobile feeding rigs are more associated with gut bombs than health-promoting goodness. But San Francisco’s Bowl’d Acai truck is changing that perception one Vitamix blend at a time with a trending specialty that’s equal parts nutritious and decadent: the açai bowl. 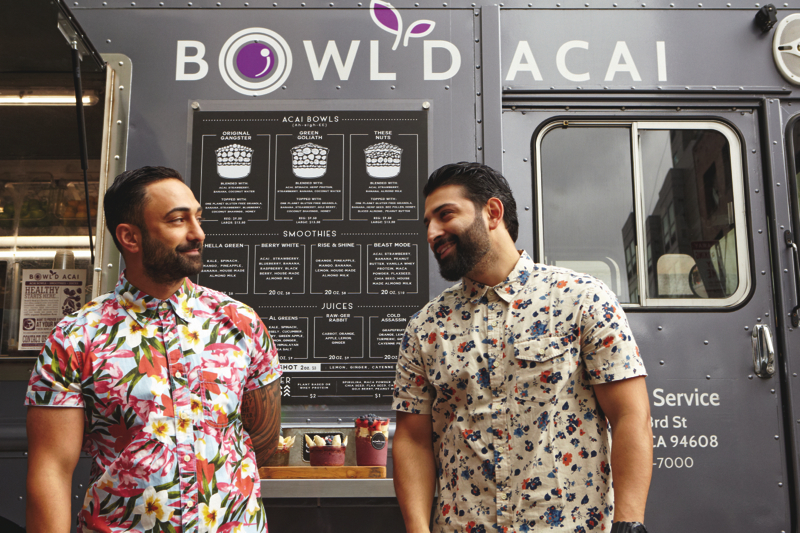 Bowl’d Acai is the brainchild of childhood friends Reza Morvari and Angel Serratos, who led successful sales careers, in fashion and technology respectively, before deciding to go into the food business together. After exploring various options, the pair set their sights on the açai bowl, largely because of its health aspects. This frozen, non-dairy, and ultra-creamy parfait of antioxidant- rich açai berry pulp topped with energy-boosting embellishments has been a popular café snack of Brazilian jujitsu practitioners and Hawaiian surfers for decades. The base of the cult attraction is the açai berry (pronounced ah-sigh-EE), the fruit of a palm tree found in the Amazon rain forest that’s believed to contain more antioxidants than blueberries, cranberries, or strawberries, earning it the moniker “blueberries on steroids.” On its own, its flavor is tart with a bitter finish, but when blended with sweet fruits, it tastes like blackberry ice cream with undertones of dark chocolate. Before rolling out Bowl’d Acai, Reza and Angel learned as much as they could about the exotic fruit and its various presentations, hitting up açai cafés in Brazil and up and down the California coast. A very distant cousin from the rustic shacks that inspired them, their truck is sleek, ultra-polished, and gunmetal gray with just a hint of its namesake purple berry in its whimsical logo. It’s not the only game in town; there are more than a half- dozen brick-and-mortar cafés whirling up açai bowls and smoothies. But what sets Bowl ’d Acai apart is what you find in most of the City’s award-winning dining establishments: quality ingredients and attention to detail. 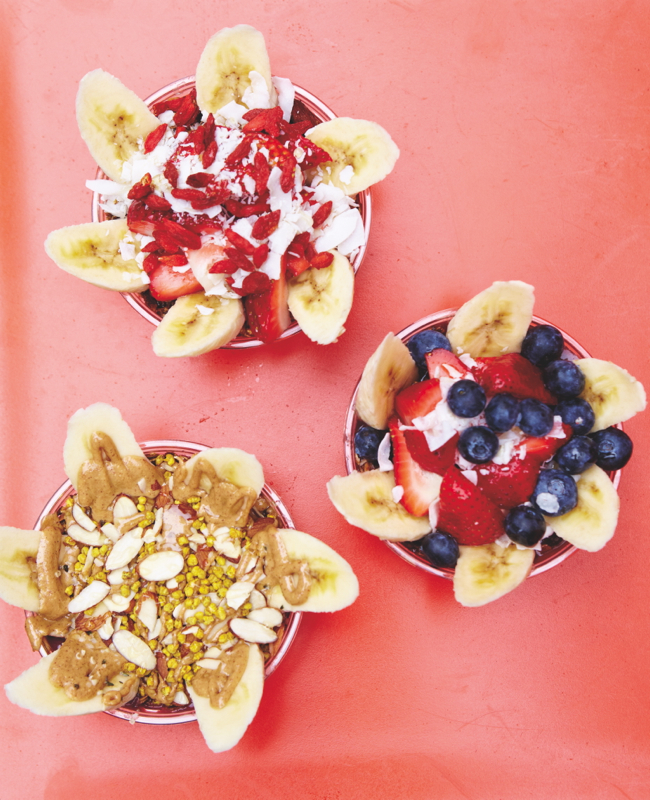 At Bowl’d Acai, even the basic bowl, Original Gangster, is a big step up from your average Brazilian surf-shack offering, which typically contains conventional, high-fructose apple juice topped with a sprinkle of granola and a few slices of banana. Here, certified organic açai pulp is blended with house-made almond milk, the fruit toppings are locally sourced, and the custom One Planet granola blend is non-GMO, organic, and gluten-free. Add artistic presentation, a hyperactive social-media account, and Reza and Angel’s charisma, and you’ve got their recipe for success. “Best New Food Truck” by SF Weekly and featured in the San Francisco Chronicle. But perhaps the most telling endorsement is this: Bowl’d parks for breakfast and lunch in pedestrian alley Mint Plaza in downtown San Francisco, just a few feet away from famed Blue Bottle Coffee café, and on a weekday morning, you’ll see nearly as many folks line up for a $9.50 Original Gangster bowl as for a $3 cup of the legendary drip. We get it. 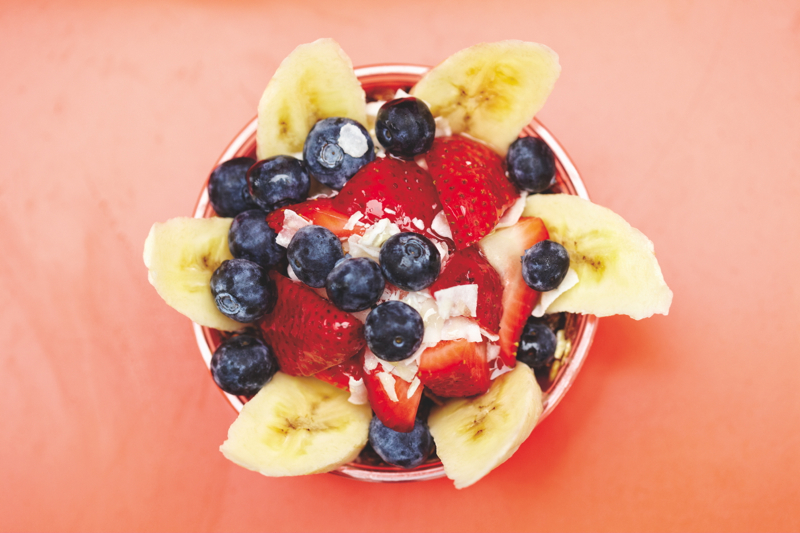 The açai bowl experience is like eating a healthy sundae that will keep you energized and full for hours. Even cult coffee can’t do that. Get Bowl’d Acai’s awesome açai bowl recipe here.